After traveling in Berlin for 4 days, I have three new watercolors to share with you! Our assignment was to paint on our trips, and I had plenty of cool subjects to choose from. I can feel myself slowly getting better at watercolor, but it takes a ton of patience. I also really need to invest in some better watercolor paper. I think it will really improve the quality + color payoff of my paintings. Let's take a look! On my first day in Berlin, my family took me to an Italian Renaissance style church on a lake in Potsdam. It was such a beautiful setting and framed the view of the lake--I felt very compelled to make a watercolor of this view! Something about Italian architecture really suits the watercolor style. You can view a photo of this church, Heilandskirche, a few posts back! 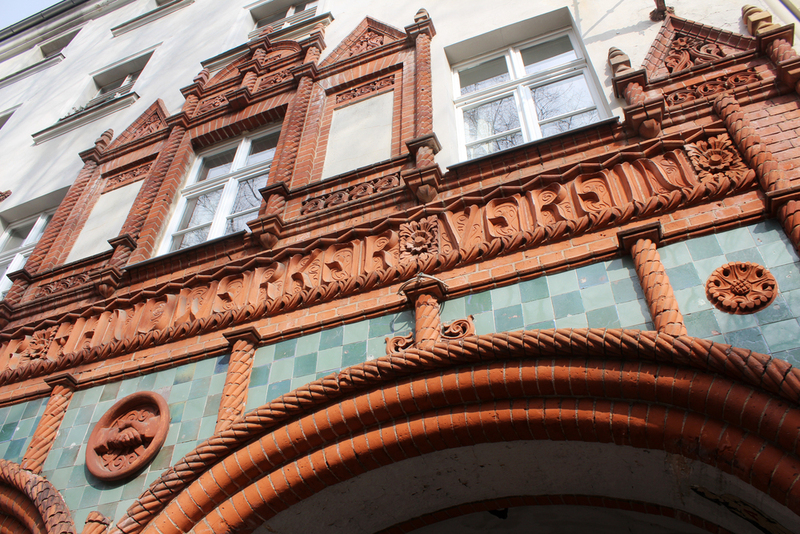 Another place I was really drawn to was this Handworkers Association in the Jewish Quarter of the city. From what I understand, it's like a union that ensures craftsmen were paid fairly + doing quality work. I loved the detail in the building facade, and this great ceramic symbol, which reminds me of trendy graphic design logos you see these days. For my final painting I wanted to try something a bit more abstract. I admittedly was also running short on time before class, so I thought it was a win-win! This watercolor is of Le Corbusier's Corbusier House. I think the colors and vertical exposed structure are very characteristic of the building, so the abstract style was suitable for capturing the building. Have you tried watercoloring yet? I think you should! I am thinking about sharing what supplies I use in next week's post to help you get started. Let me know if this is something you'd be interested in!